Number of yellowfin tuna caught (vertical axis) by 2-cm size class (horizontal axis) in 2012. Blue colours indicate tuna caught by purse seines; yellow indicates tuna caught by fisheries in Indonesia and the Philippines. Yellowfin matures by about 100 cm. Source: Williams, P. and Terawasi, P. 2013. Overview of tuna fisheries in the Western and Central Pacific Ocean, including economic conditions. WCPFC Scientific Commission, Ninth Regular Session. You can use juvenile tuna as bait, consume it yourself, or sell it. But each juvenile tuna you don’t catch may become an adult. This adult tuna would then produce more tuna. It might also fetch a higher market price, especially if it is yellowfin tuna. Granted, it may also be caught in Pacific areas outside Indonesia. In that case Indonesia would not benefit from this one juvenile tuna it leaves in the ocean, although other countries would. 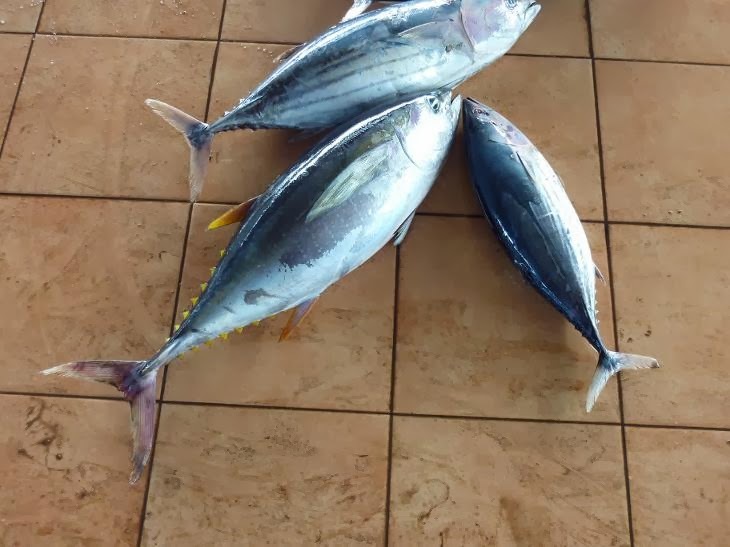 So the catch of juvenile tuna is one of the issues WCPFC would like Indonesia to address. 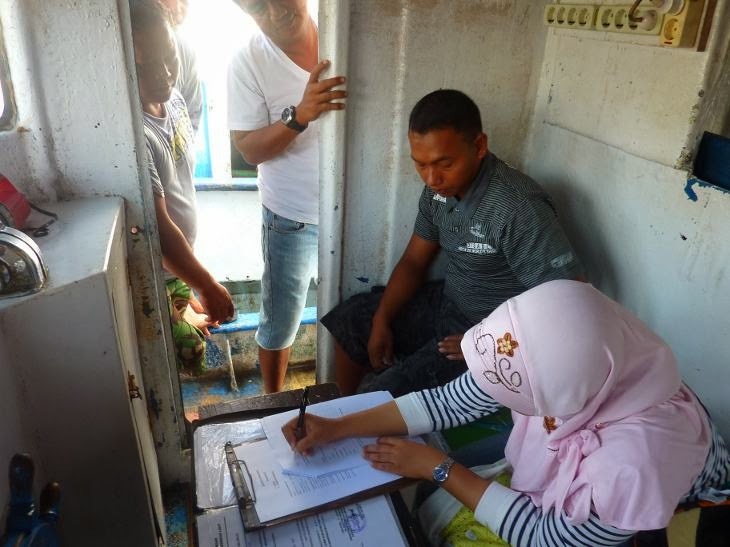 Shinta Yuniarta, one of our PhD candidates on BESTTuna, is currently trying to estimate the magnitude of the catch of juvenile tuna (or baby tuna, as the Indonesian fishers call it) through a survey in such ports as Bitung and Ambon. 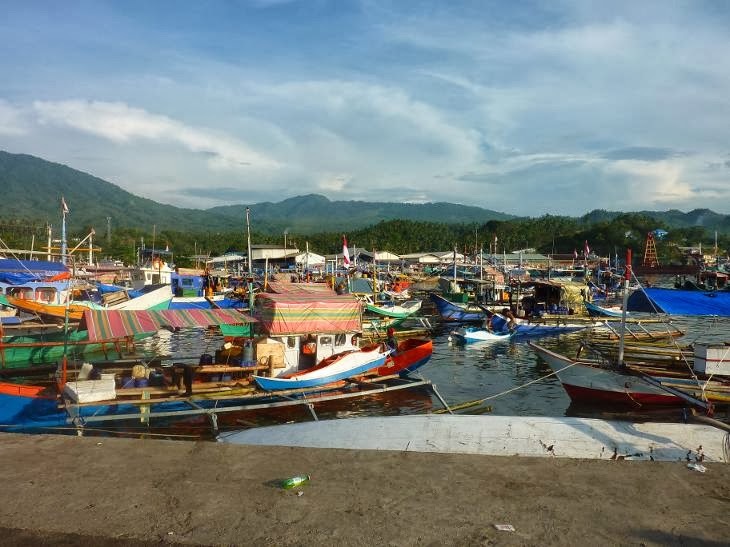 I visited Shinta last week in Bitung to learn as much as I could about the situation on the ground, and to work with her in further sharpening the survey questions and the rest of her research. It was one of those trips that stay with you long after you have boarded the airplane back home. 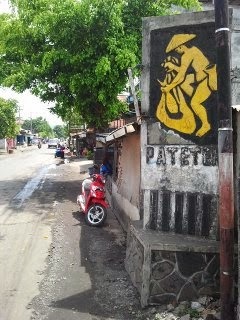 Everything in Bitung says “fish”. And very often, it actually says “tuna”. The hotel even smelled of fish when I arrived. It sports a picture of a bigeye tuna right above the breakfast buffet. Small eateries (warung makan as the Indonesians call them) offer pieces of yellowfin tuna in a spicy sauce, or delicious coral fish roasted on a charcoal fire. Everywhere you look there are huge fish processing plants, canneries, or fishing companies that have their own fishing wharf. The small-scale fishers land their fish at the central landing place in the port. 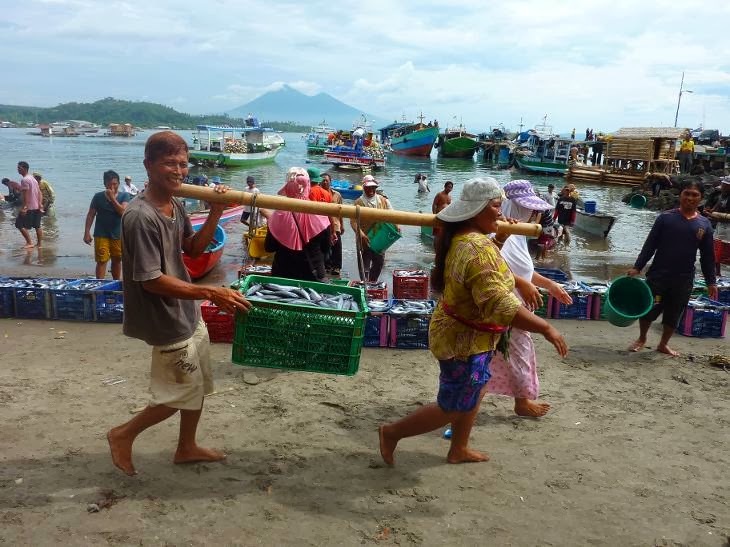 Originally it was meant to be an auction, but for some reason the auction never really got off the ground, so fishers sell their fish directly to traders who bring the fish to local markets or to processing companies. As far as I could see the small-scale fleet featured three main types of fishing. The most common seemed to be the handline fishery, where fishers use a single line with some bait on a hook to catch the tuna. Another important fishery is the pole-and-line fishery, where bait is simply thrown into the water (and water is also sprayed on the surface) to get the tuna into a feeding frenzy, so that it will bite anything that comes along. Fishers then only have to throw in a hook and the tuna will bite; these vessels are usually larger than the handline vessels, and employ a lot of crew. The third common method turned out to be the pajeko, or small purse seine, but this method was mainly used to catch not tuna, but small pelagic species such as anchovies and Indian Mackerel. In all cases the Fish Aggregation Device (FAD), or rumpon as the Indonesians call it, is important. It’s an interesting system. Before I came I was wondering: when you make a FAD and place it in the sea, how do you make sure that it is used by nobody else but you? The solution turned out to be simple: you put a guard on it. Yes, every rumpon has somebody guarding it 24 hours a day. 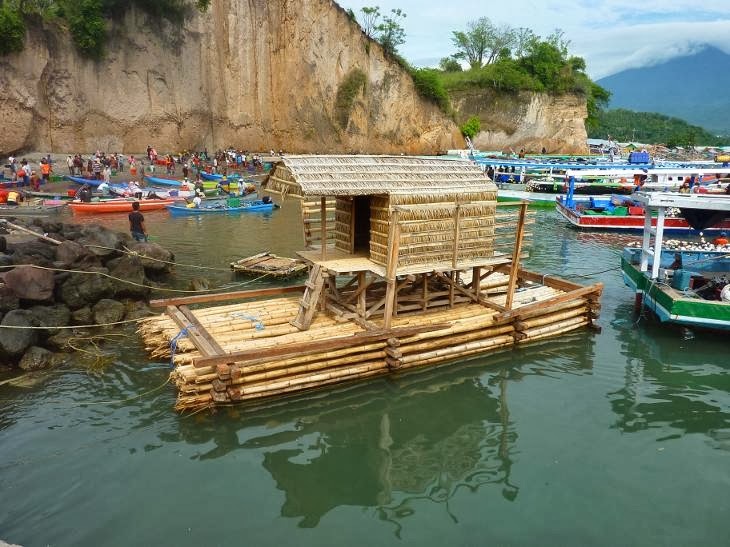 This guy lives in the small hut built on top of it, with probably some sort of radio communication, and makes sure that nobody but the owner catches the fish gathered under it unless the owner is paid a comfortable sum of money. The rumpon guard also informs the owner or his vessels of the amount of fish under it, so they won’t waste their time coming to a rumpon with no fish under it. So what did we learn so far? First, a lot of fishers readily admit that they catch a fair amount of baby tuna. They use it as bait, consume it on board, or take it home to their families. It is not illegal to catch juvenile tuna, so they seem willing to tell us how much they usually catch. And although the weight of baby tuna may be small, the number of baby tuna caught, and the fact that each baby tuna could have become a big, valuable tuna makes that the catch of baby tuna can still be a serious problem. Second, the catch of baby tuna is by far not the only unknown in the Indonesian tuna fishery. There may be unreported or even illegal catch. Some authors argue that Indonesian ports lack sufficient staff to check the accuracy of logbook data. Third, although it was fairly easy to contact and survey small-scale fishers, it turns out to be a lot more difficult to contact large-scale fishing companies. But perhaps the most important lesson was the reminder that “small-scale” does not necessarily mean “sustainable” or “green”. The idea of small-scale fishers tends to conjure up the idyllic images of hardy, honest folk that you see on Discovery Channel, read about in stories like Hemingway’s The Old Man And The Sea, or hear about in songs like The McCalmans’ “Five O’Clock In The Morning”. No doubt that the people we spoke to in Bitung are honest, hard-working people who must endure many hardships to scramble a meagre income for themselves and the family they support. But a lot of fishers and consumers may benefit greatly if less baby tuna were caught. It’s a difficult dilemma: a lot of very poor people depend on a fishing method that might disadvantage a lot of others.